A project led by University of Southampton researchers is developing a device consisting of a giant rubber tube which may hold the key to producing affordable electricity from the energy in sea waves. 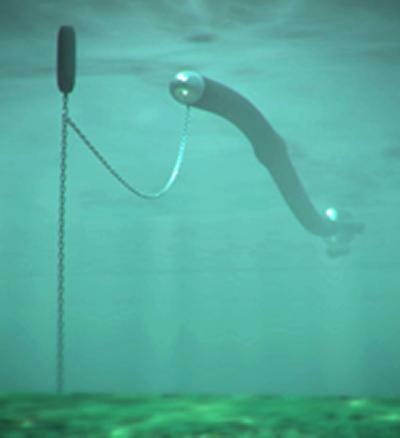 Invented in the UK, the 'Anaconda' is a totally innovative wave energy concept. Its ultra-simple design means it would be cheap to manufacture and maintain, enabling it to produce clean electricity at lower cost than other types of wave energy converter. Cost has been a key barrier to deployment of such converters to date. Named after the snake of the same name because of its long thin shape, the Anaconda is closed at both ends and filled completely with water. It is designed to be anchored just below the sea's surface, with one end facing the oncoming waves. A wave hitting the end squeezes it and causes a 'bulge wave'* to form inside the tube. As the bulge wave runs through the tube, the initial sea wave that caused it runs along the outside of the tube at the same speed, squeezing the tube more and more and causing the bulge wave to get bigger and bigger. The bulge wave then turns a turbine fitted at the far end of the device and the power produced is fed to shore via a cable. The Anaconda is, however, still at an early stage of development. The concept has only been proven at very small laboratory-scale, so important questions about its potential performance still need to be answered. Funded by the Engineering and Physical Sciences Research Council (EPSRC), and in collaboration with the Anaconda's inventors and with its developer (Checkmate SeaEnergy), engineers at the University of Southampton are now embarking on a programme of larger-scale laboratory experiments and novel mathematical studies designed to do just that. Using tubes with diameters of 0.25 and 0.5 metres, the experiments will assess the Anaconda's behaviour in regular, irregular and extreme waves. Parameters measured will include internal pressures, changes in tube shape and the forces that mooring cables would be subjected to. As well as providing insights into the device's hydrodynamic behaviour, the data will form the basis of a mathematical model that can estimate exactly how much power a full-scale Anaconda would produce. "The Anaconda could make a valuable contribution to environmental protection by encouraging the use of wave power," says Professor John Chaplin, of the Universit7y of Southampton's School of Civil Engineering and the Environment, who is leading the EPSRC-funded project. "A one-third scale model of the Anaconda could be built next year for sea testing and we could see the first full-size device deployed off the UK coast in around five years' time." Three images are available from Communications on request. The two-year project 'The Hydrodynamics of a Distensible Wave Energy Converter' is receiving EPSRC funding of just over £430,000. *A bulge wave is a wave of pressure produced when a fluid oscillates forwards and backwards inside a tube. The Anaconda was invented by Francis Farley (an experimental physicist) and Rod Rainey (of Atkins Oil and Gas). Their website on the Anaconda is at www.bulgewave.com. Manufacturing rights for the Anaconda now belong to Checkmate SeaEnergy, part of the Checkmate Group (www.checkmateuk.com). There may be advantages in making part of the tube inelastic, but this is still under assessment. The Anaconda is named after the enormous South American snake that hunts for its prey in water. It is the largest snake that spends a high proportion of its time in water environments. The mathematical studies undertaken by the EPSRC-funded project are novel because the Anaconda's response to pressures induced by surface waves is much more complex than that of a ship or an offshore structure. It has many more degrees of freedom, and motions of each kind (vertical and horizontal bending, bulging, stretching, ovalling, twisting) all interact because of the compliant nature of the rubber. Hydrodynamics is part of fluid dynamics, which is the study of fluids in motion. The University of Southampton is one of the UK's top 10 research universities, offering first-rate opportunities and facilities for study and research across a wide range of subjects in health, humanities, science and engineering. The University, which has over 22,000 students, 5000 staff, and an annual turnover in the region of £325 million, is one of the country's top institutions for engineering, computer science and medicine, and home to a range of world-leading research centres. These include the National Oceanography Centre, Southampton, the Institute of Sound and Vibration Research, the Optoelectronics Research Centre, the Centre for the Developmental Origins of Health and Disease, and the Mountbatten Centre for International Studies.